A freeway overpass is not the first place you would think to look for innovative art. But if you happen to be Joe O’Connell and Blessing Hancock, the freeway overpass is a natural canvas for industrial elegance. 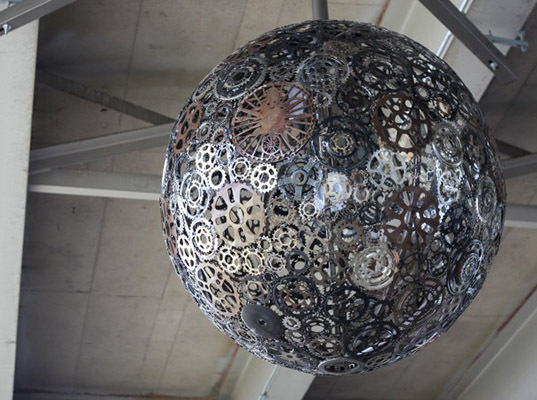 The artistic duo has created an art installation underneath a San Antonio overpass called Ballroom Luminoso, which utilizes steel, bicycle parts and LED fixtures to create a brilliant chandelier display right where you would least expect it. Located under the I-35 overpass at the intersection of Theo and Malone, the installation piece “[draws] from the formal elegance of the freeway underpass and the cultural currents of the surrounding neighborhoods, the piece transforms a forgotten space into one that connects the community,” according to the artists. The bike parts were collected from bike co-ops around the country, which were then manipulated to create the unique shapes and designs. 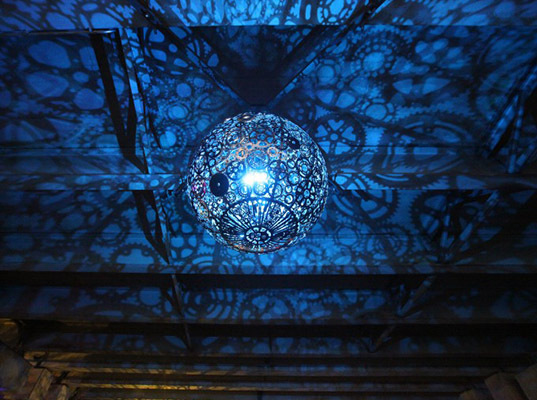 When the piece is lit up at night, each chandelier globe casts detailed shadows of sprockets and other bike pieces on the surrounding walls and pillars. The lights change color, which helps transform the mood of the space. The design itself is inspired by the culture of the surrounding area, particularly the Hispanic culture and the neighborhood’s farming origins. The piece was commissioned by Public Art San Antonio (PASA), Department for Culture and Creative Development.